True, safety is a major concern. After all, how can we prevent forest users from taking a “closer look” at the shelter and possibly getting injured? 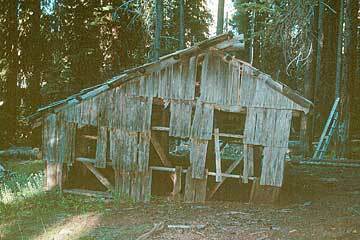 But do we, and can we, remove or destroy deteriorating structures on public lands whenever we want? Not according to the National Historic Preservation Act of 1966, as amended, which states that an assessment and determination of eligibility for the NRHP is required prior to removal or destruction of a historic building. Accordingly, the FS completed an assessment of a number of historic buildings on the forest in order to develop a plan for managing these resources, including the Cold Springs Trail Shelter. 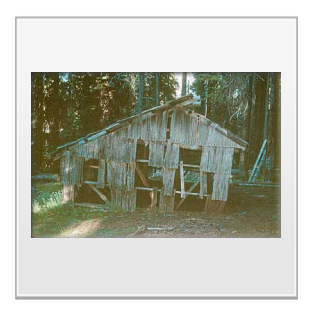 Located at one of the entrances into the Sky Lakes Wilderness in the southern Oregon Cascades, the Cold Springs building, which was built in the 1930s by the CCC, provided shelter to recreationists, hikers, and fire crews in an area that remains remote. 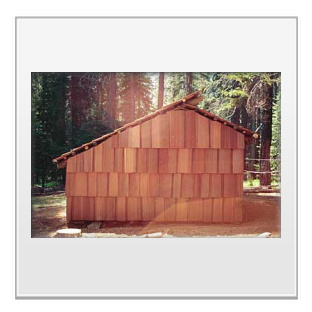 This structure is a variant of the New York Adirondack style, which features rustic construction and an asymmetrical roof. 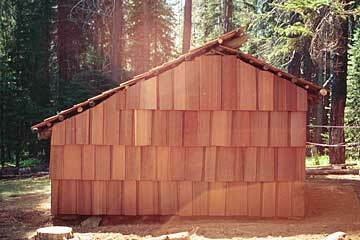 Unlike the common Adirondack style, which was constructed of logs, this shelter was built of log sills underlain by a rock foundation, posts and poles, and hand-split cedar shakes on the siding and roof. 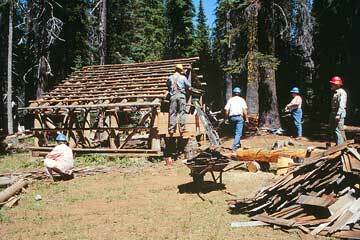 Years of use and adverse weather had taken their toll on the trail shelter. Even though the building had lost some of its integrity, it was still eligible for the NRHP. At this point in the process, the FS still had two choices: document the structure to specific standards prior to its removal or restore and maintain it. We opted for the latter. 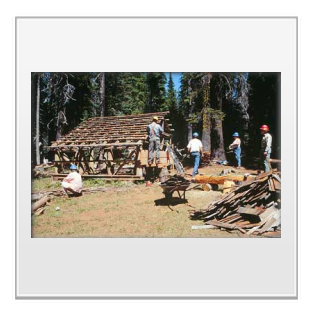 In late July 2000, seven volunteers and FS employees spent the week stabilizing and restoring the structure using traditional methods where possible. We used traditional tools, including peavies and froe and maul; on-site native materials for the posts and poles; and rocks for the foundation. We did have to purchase nails and cedar shakes. We spent the first two days stabilizing the building. This involved building temporary supports, jacking up the center truss, and using a block-and-tackle pulley system to pull the structure into an upright position. Once the building was stable, we removed the rotted 14-inch-diameter support log from underneath. One group cut and sawed and peeled and debarked the replacement log found on-site, while a couple of volunteers removed the existing shakes from the roof and siding. 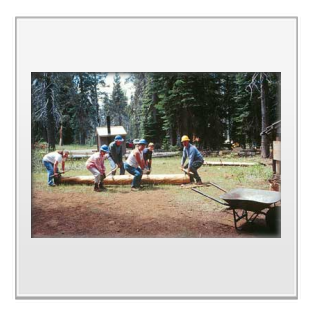 The volunteers regrouped and, using peavies and log haulers, carried the replacement log to the shelter. 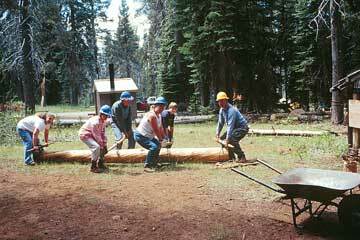 The log was split and hewn and treated with Cuprinol, a wood-preserving agent. At this point, we were all set to replace the rotted sill log. Or so we thought. By the end of the second day, we had found more rot on the post and poles than anticipated. This meant we had to get a new, larger-diameter sill log to compensate for the rot we had to remove from two support posts. More posts and poles needed to be replaced than we had originally thought, and the application of the exterior shakes turned out to be not an easy task. It seemed that every time we fixed one problem, it revealed another. However skilled we were, we confirmed the rule that it is much easier to construct a new building than it is to restore an old one. But restoring a piece of history has its own satisfaction. This was certainly a challenge, and we appreciate each and every volunteer who helped! Thank you!